The bulk of this Pemberley Conditioning Body Butter is a new-to-me butter called murumuru butter. Made from the seeds of the murumuru palm (which is not the same thing as palm oil—”palms” are a very large category of plant), this butter is very decadent. It’s not as lightweight as mango butter, but significantly lighter than shea butter. I also find it to be softer than all the other butters I’ve worked with. It massages into the skin beautifully and has what I’d call an average absorption speed. This beauty of a butter forms a full 50% of this formula. Our stunning conditioning note comes from th e inclusion of some BTMS-50, a lovely conditioning emulsifying wax. 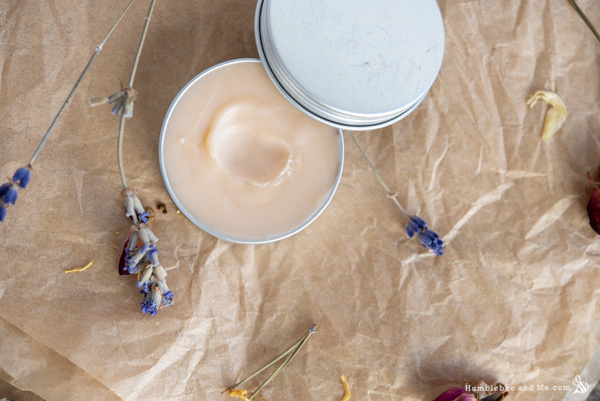 The primary reason I’ve included it in this body butter is for the utterly stunning skin feel it imparts—it is hard to adequately describe how amazing BTMS-50 makes body butters feel. 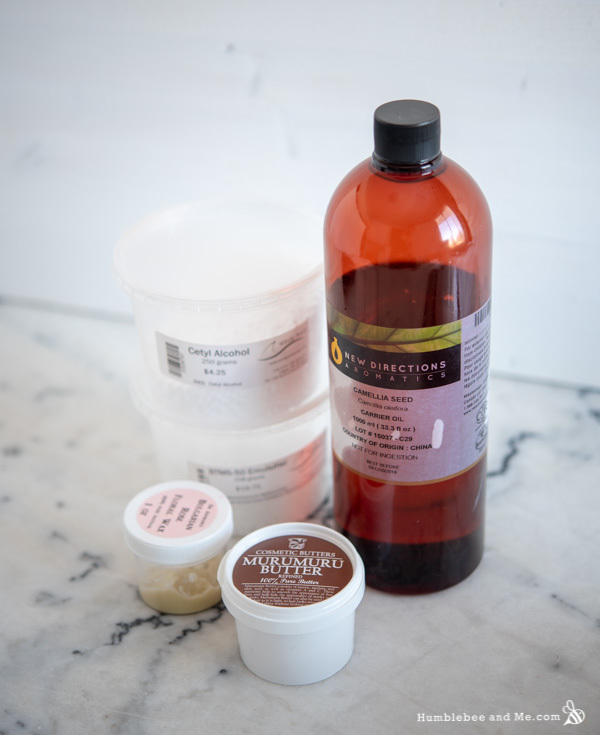 I’d recommend reading some of the comments on last year’s Sugar Plum Conditioning Body Butter to see how it’s not just me—these conditioning body butters feel utterly amazeballs. Beyond the beautiful conditioning goodness the BTMS-50 also brings some emulsifying power, so if you apply this body butter to damp skin after a bath or shower it will self-emulsify with the water left on your skin, instantly transforming into lotion, and that’s pretty dang cool. Other goodies included in this body butter are some super lightweight, fast-absorbing camellia seed oil, and some ultra-silky cetyl alcohol. 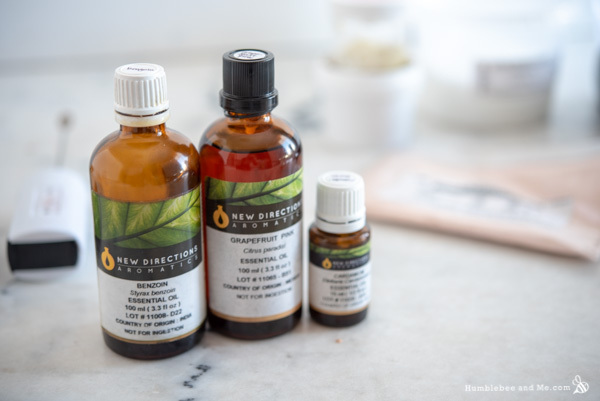 Our scent blend comes from two essential oils (bright cardamom and juicy pink grapefruit), warm and sweet benzoin resinoid, and oh-so fragrant and luxurious rose wax. I chose rose wax instead of rose essential oil because rose wax is a fraction of the price of rose essential oil, and because the maximum usage level for rose essential oil is 0.02% due to the high methyl eugenol content (methyl eugenol is a suspected carcinogen). If you wish to use rose essential oil instead, read the list of substitutions at the end of the recipe. 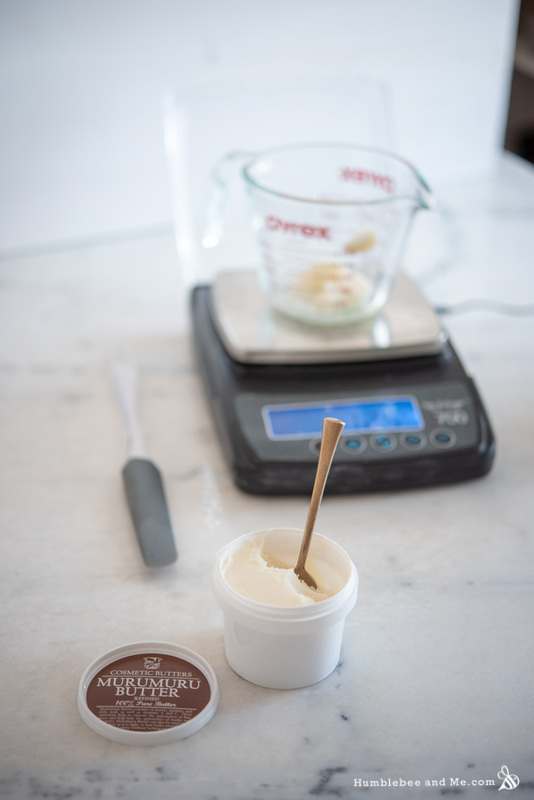 To keep things silky smooth we’ll be bringing the body butter to trace in an ice bath before chilling it in the fridge, and then allowing it to come to room temperature. I’ve found you really need to do both types of chilling in order to ensure the body butter doesn’t go mealy on you after a couple days. This is what “trace” looks like. Pouring after trace—you can see it has some viscosity to it. The finished Pemberley Conditioning Body Butter is unbelievably smooth and soft, smells incredible, and leaves your skin feeling so touchable you might find yourself rubbing your hands together like a stereotypical movie villain every time you apply it. This is good stuff—I hope you love it. 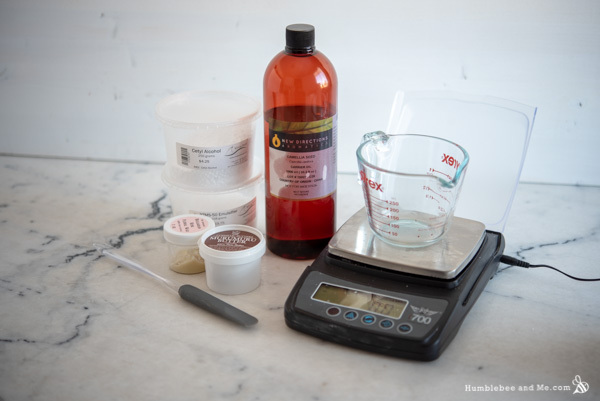 Add the mica to the melted oils and then place the oil phase measuring cup into the ice bath and cool, stirring constantly, for about thirty seconds—until you start to notice some building viscosity. Remove the container from the water bath and add the remaining cool down ingredients. Stir to incorporate. 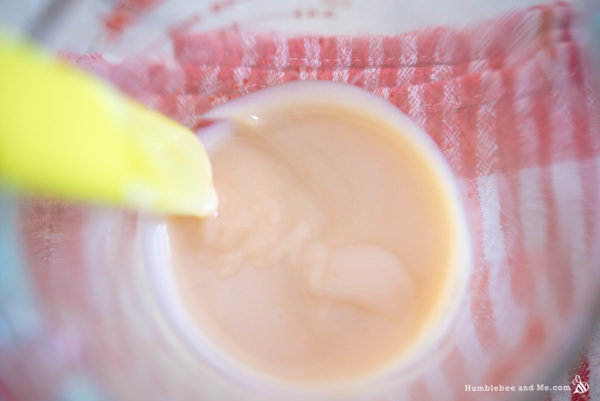 Continue stirring the mixture in the ice bath until you reach “trace”—the mixture should have enough viscosity that a small amount drizzled over the surface of the mixture leaves a “trace” for an instant. If you’re a soap maker you’ll be familiar with this—we’re looking for a rather light trace. Refer to the video to see it in action! If in doubt, stir and chill a bit longer. 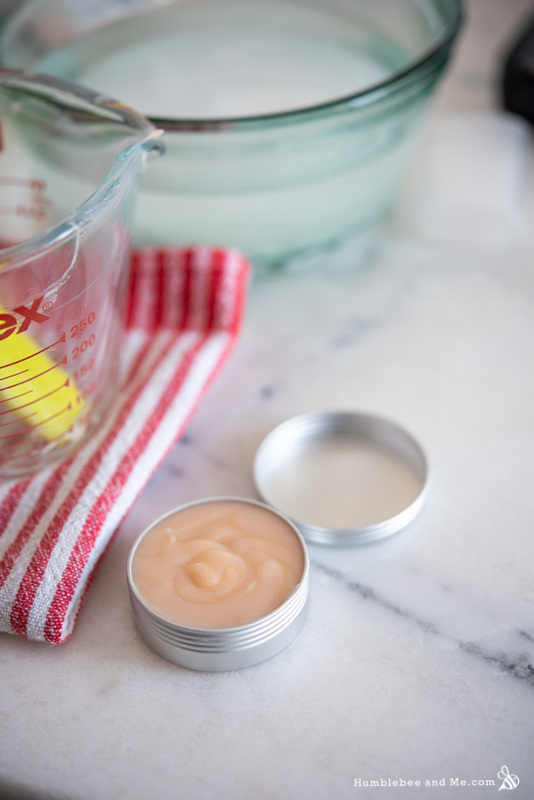 Once you reach trace (this may happen without needing to use the ice bath after adding the full cool down phase) you can now pour the body butter into a 60mL/2oz tin and quickly transfer it to the fridge to set up. When the butter has fully set up (give it an hour or two), remove it from the fridge to return to room temperature. That’s it! To use, smooth some body butter over bits of skin that need some extra love. 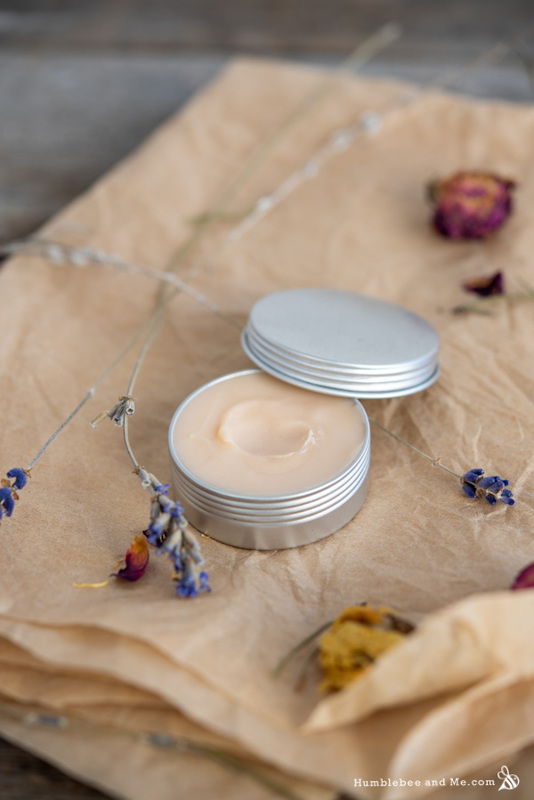 Because this body butter is 100% oil based, it does not require a broad-spectrum preservative (broad spectrum preservatives ward off microbial growth, and microbes require water to live—no water, no microbes!). Kept reasonably cool and dry, it should last at least a year before any of the oils go rancid. If you notice it starts to smell like old nuts or crayons, that’s a sign that the oils have begun to oxidize; chuck it out and make a fresh batch if that happens. As I’ve provided this recipe in percentages as well as grams you can easily calculate it to any size using a simple spreadsheet as I’ve explained in this post. As written in grams this recipe will make 25g, which nicely fills a 30mL (1fl oz) tin. To learn more about the ingredients used in this recipe, including why they’re included and what you can substitute them with, please visit the Humblebee & Me Encyclopedia. It doesn’t have everything in it yet, but there’s lots of good information there! If I have not given a specific substitution suggestion in this list please look up the ingredient in the encyclopedia before asking. 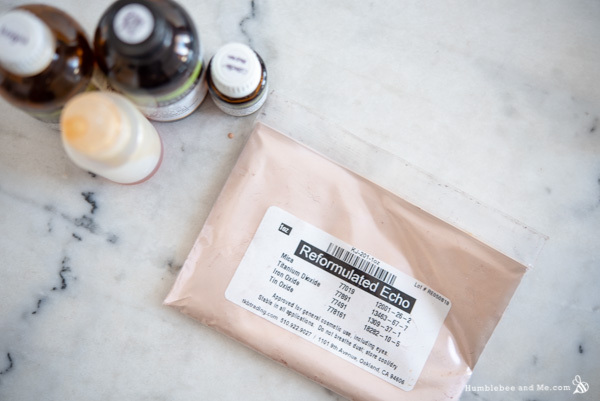 You could use BTMS-25 instead of BTMS-50, though this will result in less conditioning as 25 has half the amount of active conditioning ingredient as 50. 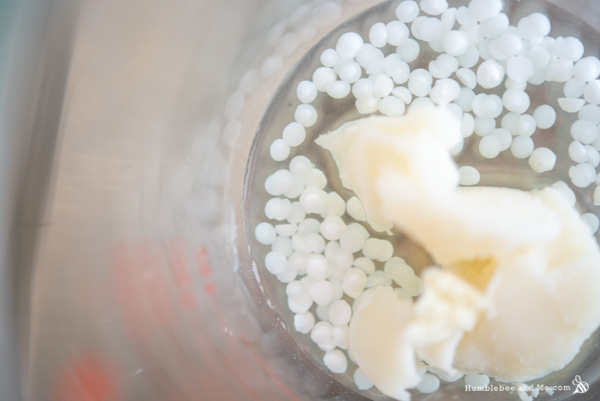 Don’t use a non-cationic emulsifying wax instead—if you don’t have a cationic emulsifying wax I would recommend making a different body butter recipe that doesn’t hinge on the inclusion of a cationic emulsifying wax. You could use a different soft butter (cupuacu butter would be my next choice, followed by mango butter) instead of the murumuru butter. You can try cetearyl alcohol (USA / Canada) instead of cetyl alcohol, but this will give a different feel to the end product. You can use a different essential oil blend if you prefer, just be sure to keep maximum usage rates in mind. The mica is optional; replace it with more liquid oil if you eliminate it. If you have rose essential oil, but no rose wax, I recommend adding 0.98% more murumuru butter and including 0.02% rose essential oil in the cool down phase. The murumuru butter was gifted by Mystic Moments. Wahoo! And oh my goodness, SNOW DAYS?! It’s… April! No no no, it’s much too late for that kind of nonsense 😐 (It snowed a couple days ago here, too, ha). What can we substitute the rose wax for? 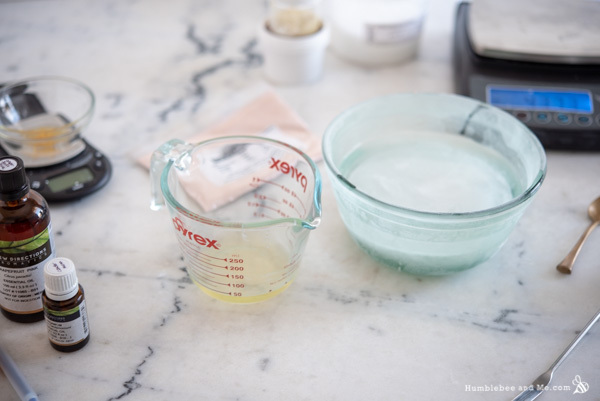 Marie posted this in her formula, “If you have rose essential oil, but no rose wax, I recommend adding 0.98% more murumuru butter and including 0.02% rose essential oil in the cool down phase.” same principle if you don’t have rose wax. Up your murumuru butter! Enjoy! I was very curious about how your Murmuru Butter looks because mine has a fast absorbency rate and it’s softer than Mango Butter, and they are very very different! Mine is a translucent white and when hard, it has such a funny & interesting shape and texture, kind of like frozen soft crates. Alas, there is not yet a Murmuru Butter entry on the encylopedia! But yes, did a quick google search, and Murmuru Butter can be a wide array of colours depending on where and when it was harvested and processed. Mine is the exact same as Marie’s! 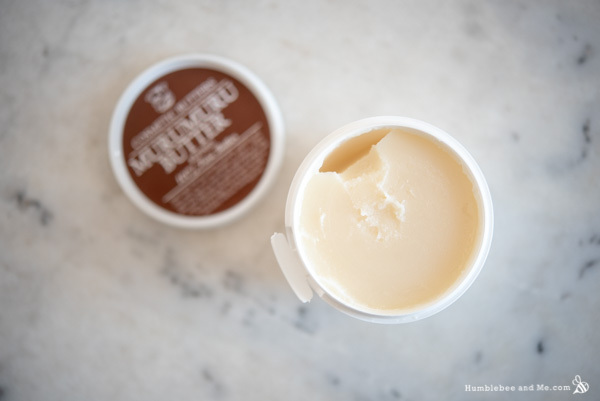 Did you end up making the Pemberley Conditioning Body Butter? I’ve not personally worked with it before, but I have read about it and it has me drooling for a few grams to play with! Have you used it? What’s it like? No I have not worked with it before but it’s in one of The Acid Queen’s recipes:) I’m also very curious about it too! Ohhh… ok! If you get your hands on it, I hope you’ll let me know your results! If you had a word cloud of your recipes’ ingredients on the website, then your followers could see what ingredients you use over and over again and what would be worth purchasing. 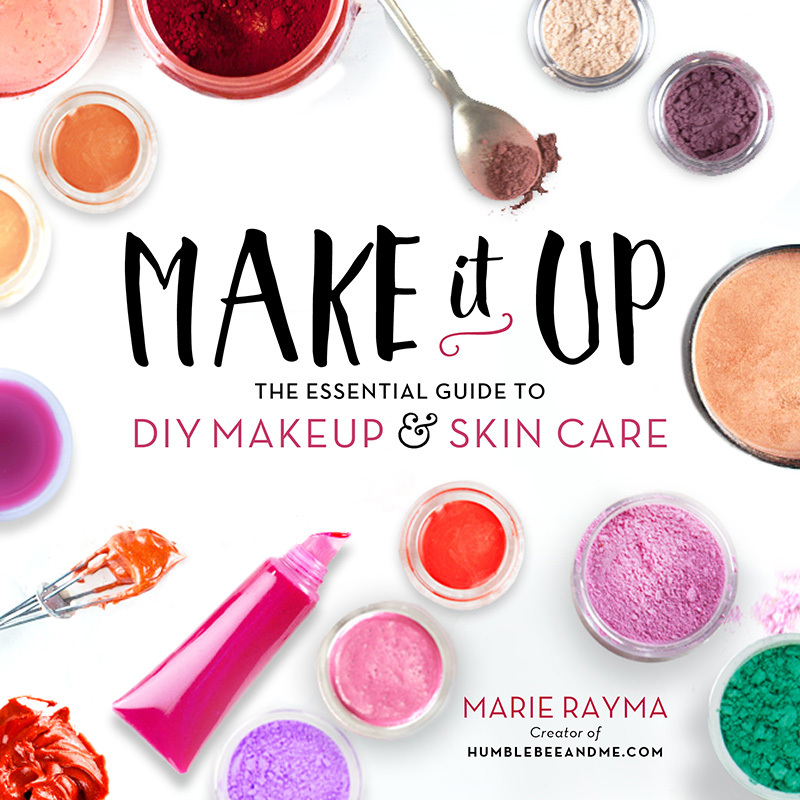 I thought of this after seeing this recipe and rushing to add BTMS-50 to my cart over at Lotion Crafter, but then freezing with indecision about whether I should go ahead and shop around—but what else do I need?? ?— or check out with only the BTMS. I know it would be a lot of work to go back and word cloud your past 900+ recipes, so you could just word cloud future recipes. Howdy Marie just diwnloaded the pdf file and for some reason the cool down phase was not on there just wanted to let you know and I even downloaded it again to recheck it’s like a page is missing somehow. Just givin ya a heads up there! I love the downloads you are fantastic keep up the good work girlfriend!! I’m afraid that’s a third party plug in I have zero control over, sorry!